There are as many ​pastel recipes as there are cooks. This is just one version. You can always add or take away ingredients to meet your preferences. It's hard work, but well worth the effort. Every year, women gather their families together—even the youngest are assigned a job—to make pasteles by the hundreds that are frozen to be enjoyed over the holidays and all the way up to Ash Wednesday and the fasting days of Lent. Brown the diced pork in a large nonstick skillet. Add the ajíces ​dulces, onion, recaito, garlic, adobo, oregano, and bay leaf, stirring well. ingredients. Cook until the pork is no longer pink inside. Remove the bay leaf and set aside to cool. 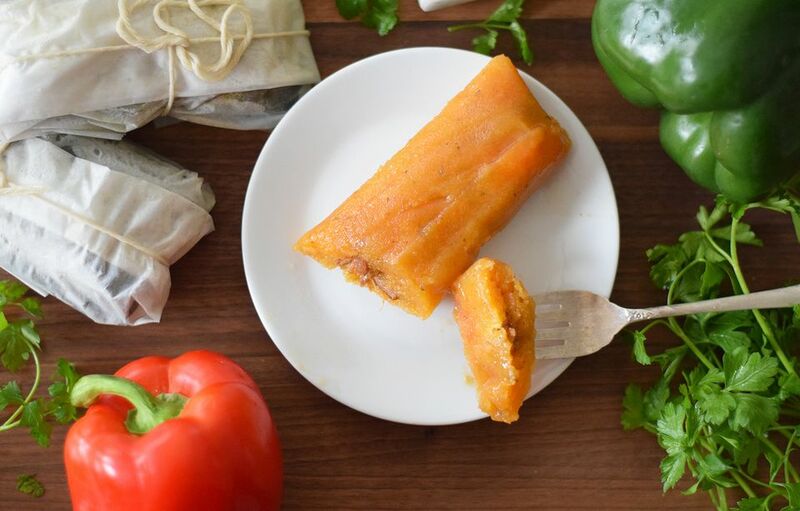 In a large bowl, grate the yautía and the green bananas, or yuca, if you are making yuca pasteles. Blend them in a food processor until creamy. Drain the masa over cheese cloth or a fine mesh sieve for at least 3 hours. Stir in the salt, recaito, and enough of the achiote oil to moisten the dough and add a little color. You are now ready to assemble and wrap the pasteles. Prepare a work surface to assemble and wrap the pasteles. If you have friends helping you, set up an assembly line. For each pastel, lay out a piece of parchment paper, topped with one piece of banana leaf. Brush achiote oil in a rectangle shape on the center of the banana leaf. Spread 1 1/2 to 2 spoonfuls of masa into the center of the leaf. Add one spoonful of pork filling and top with another spoonful of masa. Bring the edges of the banana leaf over the top of the pork filling. Then repeat with the other side of the banana leaf so that the masa completely covers the top of the filling. Bring the edges of the banana leaf together and fold down over the top. Fold the edges of the banana leaf underneath the package. Bring the top and bottom edges of the parchment paper over the top, fold or roll down the edges to make a horizontal seam. Tuck the ends under. Tie with a string in both directions. At this point, you can freeze any pasteles you are not going to cook and eat right away. Place them in zip-top bags, date, label, and freeze. Bring a stock pot of salted water to a boil. Place the pasteles in the water, making sure they are submerged. Reduce the heat and simmer for 1 hour. Using tongs, remove the pasteles from the boiling water and place on a plate. Cut the string with kitchen scissors and very carefully (so the steam doesn't burn you) open the banana leaves and parchment paper and place on a serving plate. They can be served with pique criollo (Puerto Rican hot sauce), rice and pigeon peas (arroz con gandules), escabeche (seared and marinated cold meats or fish), roasted pork, and other holiday foods. If you want to freeze these pasteles for later, prepare them up through the point when you wrap them in the banana leaves and parchment paper. Tie them up, place them in gallon-sized zip loc bags, and then freeze them, raw. When ready to cook, place the frozen pasteles in a pot of boiling water directly from the freezer. Cook for an hour, until tender.